Copyright 2016 Anita Kelsey – originally written for Style Tails. For cat owners the The importance of a cat tree cannot be underestimated although, for urban cat owners, finding space for a cat tree in a small apartment can be a challenge. There’s also the issue of aesthetics with some less-than-attractive options on the market, but cat trees have have a very important role to play in a cat’s life. Cat trees encourage many major functions which are invaluable to a cat’s wellbeing – the climbing poles double up as scratching posts, allowing the cat not only to take care of their claws and exercise the surrounding muscles, but also to leave their scent on; the climbing enables a cat to get exercise and is the closest thing to climbing a real tree (a natural everyday action for an outdoor cat). Importantly, the raised level of the tree enables the cat to feel secure in a high place away from people and dogs looking down on its territory. 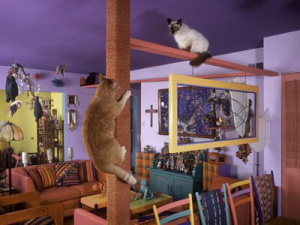 Not all cats will choose to be up high, but if you have one that clearly does love vertical spaces, then get creative – your cat will love you for it. Cat trees are also great tool if you have a baby or small children because it allows the cat to remain in the same room as the children, but be high enough to avoid prodding from excitable little hands. Ultimately, the cat tree is a piece of furniture that belongs to the cat alone and I would encourage any cat carer to consider finding a space to put one. The type of cat tree you get will depend on the space you have, as well as your cat’s personality and breed. Large breeds need large platforms to lie on and most cannot fit into the cubby holes unless the tree states it is suitable for bigger breeds. Try to be generous with your living space and think outside of the box if space is limited; true co-habitation needs to provide for both humans AND cats, so try to de-clutter to make way for new ideas. Cool, contemporary and rather clever, the Sebastian Modern Cat Tree combines six levels of fun for your feline, sisal scratching mat for claws, soft carpeted cubby for lounging, quiet hiding places, and space for your books and ornaments. These cool cat towers by Catissa tick so many boxes (pardon the pun) that it’s hard to know where to begin. First of all, they use zero floor space in your flat or apartment so they’re great for small spaces; secondly, they’re nice and high, giving cats a place to perch above all the action on the ground; thirdly, each of the modular cubby holes is fitted with a beautifully soft sheepskin mat for kneading and sleeping; and lastly – they look amazing! 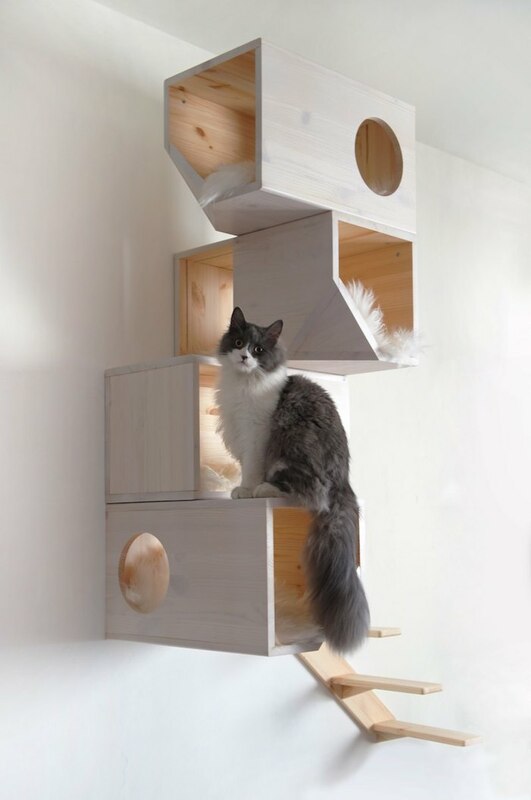 Cool cats can channel a retro vibe with this 1960’s inspired cat tree from Wohnblock. The carpeted shelves offer loads of space for perching and scratching, while the height makes it perfect for cats that love to climb. Made to order in Germany, you can choose your colour of frame and carpet to suit your home. Your cat will think they’ve used all their nine lives and gone up to kitty heaven with this amazing Necobaco Cat Tree. 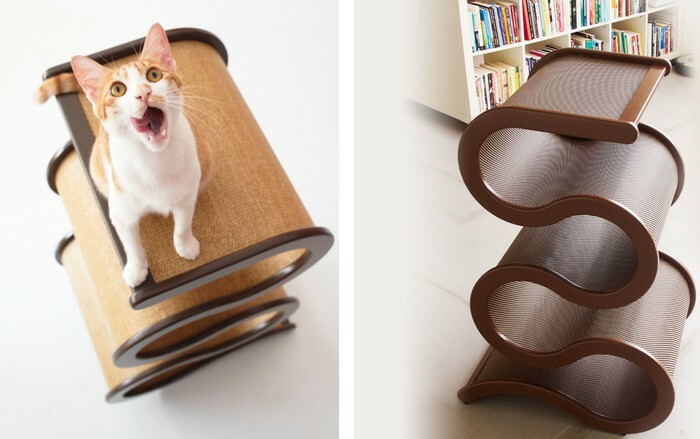 Designed by Japanese company Clavo, it’s architecture meets felines. Heaps of places to hide, climb, play and perch – the only downside is you’ll need to go to Japan to get one. Not just a talking point in your living space, cats also love the fluid lines of the Curvynest. The modern design uses a curved, snaking form to create an ultra cool and very functional cat tree. Cats mould themselves perfectly in the Curvynest’s loops and ledges, while the surface is made from tough woven fibre to withstand plenty of scratching.